Hill descent control is a car safety feature that’s designed to facilitate safe travel down steep grades. The feature is primarily intended for use in rough terrain, but it can be used whenever a driver wants to descend slowly down a steep hill. Unlike cruise control, which typically only works above a certain speed, hill descent control systems are usually designed so that they can only be activated if the vehicle is moving slower than 15 or 20 mph. The specifics vary from one automaker to the next, but it is generally a low-speed technology. Hill descent control systems are designed to help drivers maintain control when driving down steep hills. Jeremy Laukkonen. Lifewire, 2013. The vehicle is driving at a slow speed on a steep grade, and the driver engages hill descent control. 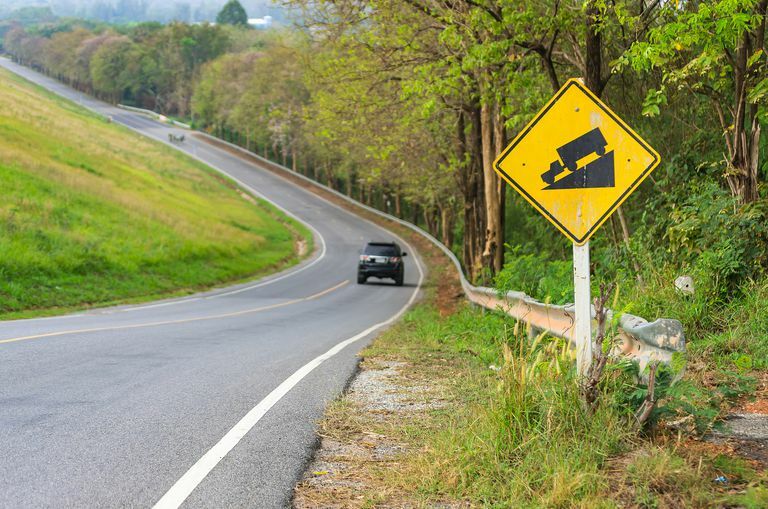 The steep descent would typically cause the vehicle speed to increase, but hill descent control uses anti-lock brakes and other systems to maintain the speed. The speed remains slow throughout the descent, even if the grade decreases. When the road levels off, the driver can shut hill descent off and increase the speed of the vehicle. Like many other automotive safety features and advanced driver assistance systems, hill descent control automates a task that a driver would typically have to do manually. In this case, that task is controlling the speed of a vehicle on a downslope without losing traction. Drivers usually accomplish that by downshifting and tapping the brakes, which is also the same basic method utilized by hill descent control systems. The way hill descent control works is very similar to the way that traction control and electronic stability control work. Just like those systems, HDC can interface with the ABS hardware and pulse the brakes without any input from the driver. Each wheel can be independently controlled in this manner, which allows the hill descent control system to maintain traction by locking up or releasing individual wheels as the need arises. Some OEMs offer Hill descent control systems, and the precise operation of each system is slightly different. The one characteristic that most systems include is that the speed of the vehicle needs to be below a specific threshold for hill descent control to work. These systems are designed to safely maintain speed, not reduce a dangerous speed to a safe speed. Most automakers require the vehicle to be below about 20mph, but there are some exceptions. In some cases, such as in the Nissan Frontier, the speed threshold changes depending on the gear setting. A vehicle that is equipped with descent control typically also has to be in either forward or reverse gear, not neutral, and on a grade before hill descent control can be activated. Most vehicles with HDC have some indicator on the dash that shows when all of the conditions are met, and the feature is available. When all of the prerequisites are met, hill descent control is typically activated by pressing a button. Depending on the manufacturer, the button may be located on the center console, below the instrument cluster, or elsewhere. Some automakers, such as Nissan, use a rocker switch instead of a simple button. After hill descent control has been activated, each system is operated a little differently from the others. In some cases, the speed of the vehicle can be controlled by the cruise control buttons. In other cases, the speed can be increased by tapping the gas and decreased by tapping the brake. Bosch developed the first hill descent control system for Land Rover, which introduced it as a feature of its Freelander model. The Freelander lacked the low range gearbox and differential locking features of the Land Rover and other 4x4 off-road vehicles, and HDC was billed as a fix for that situation. The initial implementation of the technology suffered from a few drawbacks, including a preset speed that was too high for many situations. Later implementations of hill descent control, both by Land Rover and other automakers, either set a “walking pace” speed or allow the driver to adjust the speed on the fly. Vehicles equipped with this style of hill descent control are better suited for use in rough terrain with loose or muddy surfaces and very steep hills. Who Offers Hill Descent Control? Land Rover originally introduced Hill descent control, and it’s still available on models like the Freelander and Range Rover. In addition to Land Rover, some other automakers have also introduced similar features on SUVs, crossovers, station wagons, sedans, and trucks. Some of the other companies that offer hill descent control include Ford, Nissan, BMW, and Volvo, but the technology is added to more model lines each year. If you're in the market for a new vehicle, and you enjoy off-roading, then your best option is to ask for vehicles that include hill descent control when you visit your local dealerships.